X-O Manowar Retribution TPB 1, (1993) Valiant. 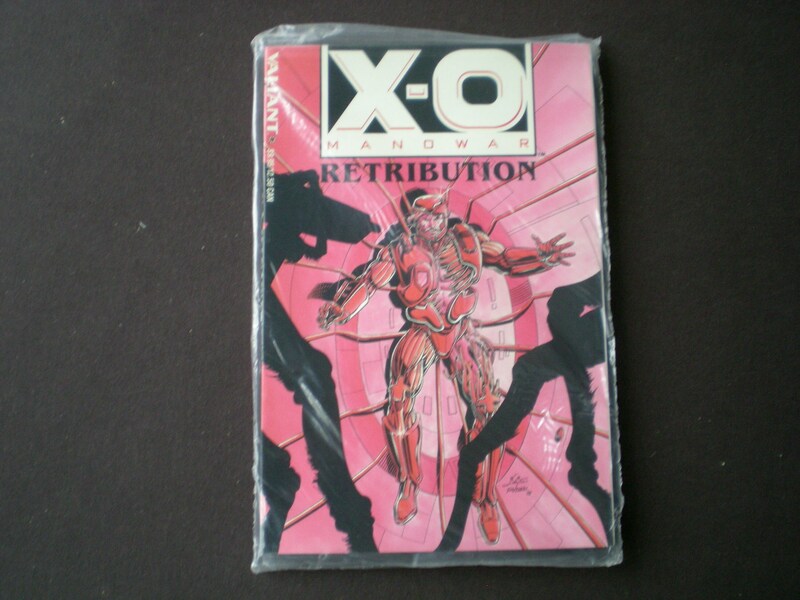 Poly-bagged with X-O Database (1993) 1 Shot Comic, 1st Printing. Collects X-O Manowar (1992-1996 1st Series) #1-4. Appearance by Solar, Man of the Atom. Written by Bob Layton, Jim Shooter, and Steve Englehart. Art by Barry Windsor-Smith, Sal Velluto, and Mike Manley. Cover by Bob Layton and Tom Ryder. NEW softcover trade paper Take a close look at photos provided. Domestic shipping includes insurance coverage. Shipped fast and arrived in the condition promised! Items shipped on time, and were in EXCELLENT condition. We accept credit cards, paypal, personal checks and money orders. Orders will be shipped upon payment receipt. Orders paid with personal checks and money orders will need to clear before the orders are shipped. Comics are sold, "as is" as shown in the photos. If you are not satisfied please contact us to resolve. Insured comics damaged in shipping or lost will be refunded. In the event of a damaged delivery please keep the packaging as proof for USPS claim. Do not hesitate to contact us with any concerns or issues. Our goal is a happy buyer! We ship via USPS Insured Media Mail (4 - 10 business days). First Class (2 to 4 business days) and Priority Mail (2 - 4 business days) are available upon request. Contact us for a shipping quote. Our comics are bagged and boarded and shipped in a thick cardboard sleeve in a manila envelope, or boxed upon our discretion. If you do not wish your comic to ship in a manila envelope please contact us prior to payment. International orders are welcome. We ship worldwide. We ship standard First Class Mail - Canada $17.40, Worldwide $24.65. Priority and Registered Mail are available and shown on higher priced items. We offer discounted shipping on multiple items. Request an invoice prior to payment.